CLICK IMAGE TO ENTER MY ONLINE STORE AND SHOP NOW! Stampin' Up! is once again holding an Online Extravaganza SALE over Thanksgiving, to include Black Friday and Cyber Monday, for savings UP TO 50% OFF select products!!! It starts with a Kickoff 24-Hour Flash Sale beginning at 12:00am on November 23rd, and ends with a Closing 24-Hour Flash Sale beginning at 12:00am on November 30th. Sales prices are available While Supplies Last! CLICK ON IMAGE TO VIEW RETIRING STOCK ONLINE or SHOP NOW! *Remaining retired stock may appear on the Clearance Rack at a later date. Another word of advice for the Bargain Shoppers: if you are ready to SHOP NOW to grab the retiring stuff you want TODAY, before it's gone, do yourself a favor and stop by the Clearance Rack and Weekly Deals section of my Online Store before you check out! 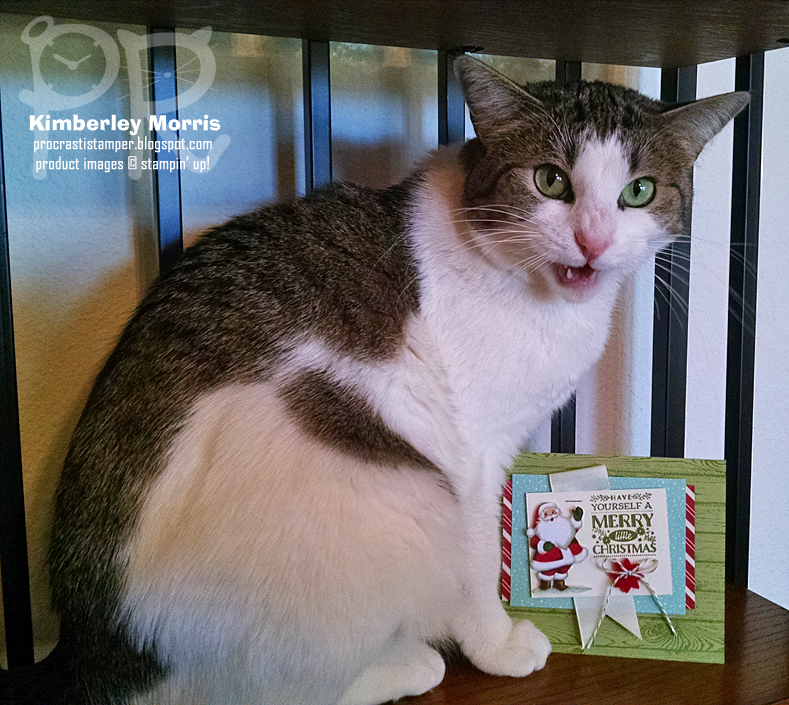 I was just minding my own business, setting up to take a picture of card to show you, and my cat Gizmo decided to be a smartypants (or smartytail, or whatever). She normally hates pictures, and turns away from them...but no matter how close I'd put the camera to her, she would NOT move out of my way! So, you get to see what an adorable, furry, twerp she can be. I could swear she's saying in this picture, "You call this a card?!? Really??" Actually, this was a tag that demonstrators got to make several months ago at a Stampin' Up! event, before the 2015 Holiday Catalog even came out. 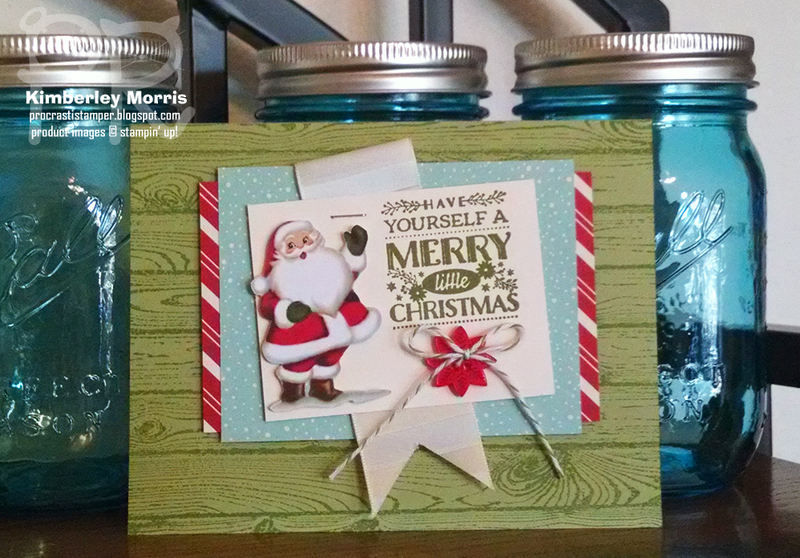 It features the Home for Christmas Suite of products. I don't usually have much use for tags, so I just adhered the whole thing to a card front I stamped with the Hardwood background stamp (available in wood-mount or clear-mount). Here's a shot of just the card--it's not super great quality because I had to put it up higher on a kitty-free shelf, and snap it quick, before kitty got beligerent. Again. Stampin' Supplies: Cozy Christmas stamp set, Hardwood background stamp, Pear Pizzazz card stock & ink, Very Vanilla card stock, Home for Christmas Designer Series Paper, Home for Christmas Designer Buttons, Very Vanilla 1-1/4" Subtle Stripes Satin Ribbon, Old Olive Baker's Twine, Handheld Stapler. DISCLAIMER: I can't guarantee you'll get a kitty showing up if you make this card, but your chances do appear to increase if you make the card, and THEN try to take a picture of it! Thankful Forest Friends stamp set with Age Awareness stamp set greeting. Photo © Stampin' Up! So...I totally was NOT going to buy the Thankful Forest Friends stamp set (available as shown, in Clear-Mount, and also in Wood-Mount), even though I thought the animals were super cute. I just didn't see using them with the greetings in that same stamp set enough this Fall to justify it. 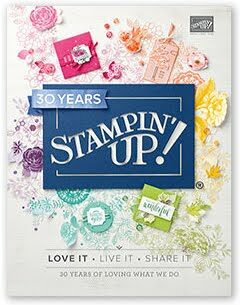 Leave it to Stampin' Up! to change my mind! You'd think that I'd have realized I can use the animals separately, after all, I have been doing this for over 21 years now. 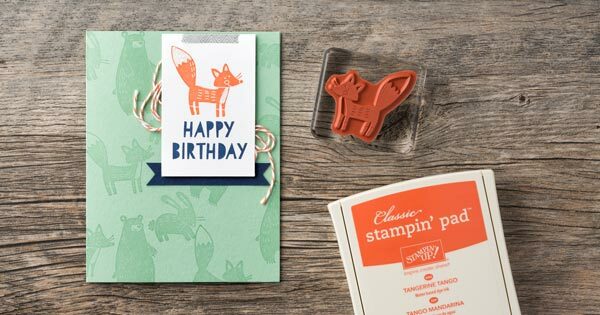 And I thought I'd better share this, because if I wasn't thinking outside of the [stamp set] box, to imagine such an adorable birthday card, maybe you weren't either! Stampin' Supplies: (this is speculation since I didn't make this card) Thankful Forest Friends stamp set, Age Awareness stamp set, Mint Macaron card stock, Whisper White card stock, Tangerine Tango ink and card stock, Night of Navy ink and card stock, Versamark (or Mint Macaron) ink pad for animals in background, Everyday Chic Designer Washi Tape, Tangerine Tango Baker's Twine (retired - maybe sub Basic Gray Baker's Twine, or Silver Metallic Thread. Are you giving this stamp set a second thought, too?? Go ahead, get it in my ONLINE STORE today!